How much money do you save each month? If you're looking for great money saving tips, then you've come to the right place! There are many ways to learn how to save money, and today I'm going to tell you about them. I am often asked for my best money saving tips from people that are having a difficult time saving money. After going through a person's spending habits, I often see a lot of money wasters and savings areas that aren’t being explored. Often what is obvious to one, may be hard for another to notice. Even if you're already taking part in some of these money saving tips, if you could just find a few more (or as many as you can! ), you may be able to improve your financial situation so that you can live your dream life. Paying off your debt quicker. Living off of one income. Going on your dream vacation. 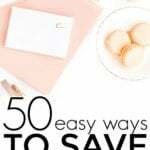 Today, we are going to talk about over 50 money saving tips and ways to save or make more money each month. If you do all of the below, you may be able to save hundreds or thousands of dollars each year. Remember, even saving a little at a time can add up to a lot of money! I'm sure we’ve all done super embarrassing things to save money. Or, at least, I know that I have! 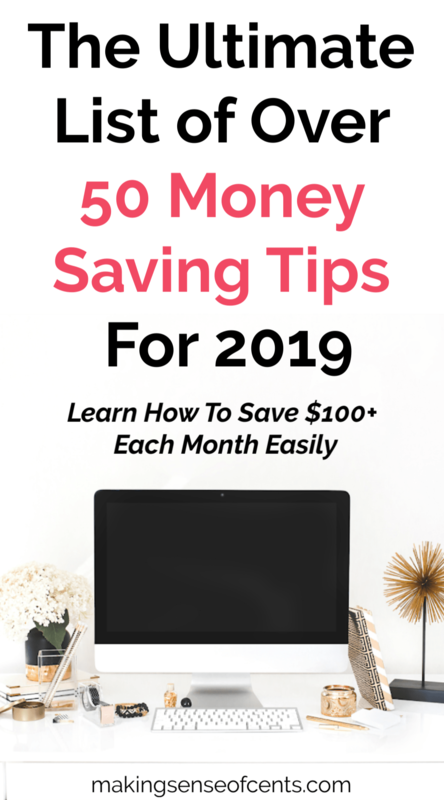 I recommend reading 60+ Extreme Things People Have Done To Save Money to see some of the interesting money saving tips other financial experts and my readers have done. Freeze water bottles instead of using the AC. Some companies will charge to check your credit score, and some people even pay for this on a monthly basis. The truth, though, is that you can receive your credit score for free a few times a year. And, that's the thing about buying lunch at work – it’s a small purchase that doesn’t seem like it would add up to much. But, bringing lunch to work has the potential to save the average person at least $100 a month, if you know what you are doing. To take part in this money saving tip, you can start by looking at these tasty budget lunch ideas. The average monthly cable bill is over $100. By the year 2020 (that's really not far away at all! ), the average cable bill is expected to be around $200 a month. We don't pay for any form of TV (not even Netflix! ), and it definitely helps us to live simply and save money. The $20 Savings Challenge is an easy and fun money saving tip that can start you on the path to saving more money without even noticing! All you have to do is save $20 each week for a year, which easily adds up to a savings of $1,040. Right now is a great time to start this savings challenge. Trying to manage your life, especially your financial life, can be difficult in today’s age. Between learning about money savings tips, planning for retirement, paying bills, raising a family, etc. life can be exhausting. And, we all have a lot of clutter in our life – not just physical, mental as well! This may sound like a simple money saving tip, but it can be difficult for some. Really, we have all experienced that regretful feeling after making a large purchase and realizing that you have made a mistake. You may be mad at yourself for wasting money, you may realize it will add to your debt, and more. In 2016, me and my husband earned over $5,000 just by using our credit cards like we normally would. We put all of our expenses on our credit cards, completely pay them off each month, and earn free rewards points and cash back. Meal plan as one of the easy money saving tips. Quit smoking (one money saving tip that will save your life). Start a blog. I created Making Sense of Cents almost six years ago, and since then, I have earned over $2,000,000 with my blog and around $979,000 in just 2016 alone. Blogging changed my life for the better, and it allows me to earn thousands of dollars a month, all by doing something that I love. You can take my free How To Start a Blog course here. Brian makes a living (it's a $650,000+ per year business for him) by picking up trash. If you're looking to make some extra money, then this may be a side hustle option for you to look into. Learn more at Get Paid $30 – $50 Per Hour To Pick Up Trash. This is sad when you consider that many also take out high-interest loans in order to pay for their car. Back when my husband worked in new car sales, he often told me about new car buyers who had car loans at interest rates of 20% and above. 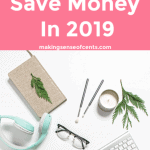 Learning to have fun saving money is always a good idea, because it can help you save more money and make learning about the different money saving tips more enjoyable. For example, your AC will automatically turn up when you leave for work so that you don’t waste electricity or money cooling an empty house. You can also program it for while you are sleeping, for the weekend, when you are on vacation, and so on. Eating out just one less time each month is an easy money saving tip, plus it will help you save a nice chunk of change over a one-year period. Sign up for a website like Ebates where you can earn CASH BACK for just spending how you normally would online. Stores you can use Ebates at include Walmart, Target, Macy's, Amazon, Kohls, and more. This is another one of the easy ways to save money because you're probably already shopping at one of their partner stores. All of that money can add up to a lot of stress! Cutting down your entertainment budget doesn’t just save you money, it is also one of the ways to simplify your life in the new year. There are many ways to have fun for less. Check out How To Have Frugal Fun for some of my ideas. One of the many easy money saving tips is to take online surveys. No, taking online surveys isn’t really a way to cut back your budget, but you may be able to earn money without doing much, and that money you make can easily be put into savings. If you sign up for all of them, you may be able to earn anywhere from $25 to $100+ a month by just taking surveys online. Airbnb vacation home rates are usually comparable or cheaper than a hotel, plus you typically have more room and there is usually a kitchen as well. Also, if you have a lot of people going on vacation with you, you can split a house for a much lower price than it would be for everyone to get a hotel room. Airbnb is my favorite way to travel, and we hardly ever stay in hotels anymore. We love being able to bring our dogs with us, meaning they’re more comfortable as well. No dog has ever complained about having a backyard to run around in! Be flexible with your flight dates. A difference of just a day or two can sometimes save you over $100. Travel in the mid or off season instead of the peak travel season for the specific destination that you are interested in. Stay in an Airbnb (mentioned above) for a better travel budget. 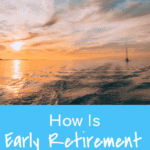 Retire in the future- and possibly even retire early! You can check out the latest bestseller, a classic you’ve been wanting to read, or borrow a movie, which you can then bring home and have a fun night in with friends and/or family members. Instead, you should only purchase the things that you can afford and truly want. Who cares about what other people have?! Swagbucks allows me to occasionally earn Amazon gift cards with very little work. Yes, this is definitely one of the easy money saving tips that you can take advantage of today. Gambling at the casino and playing the lottery are both risky moves, and my money saving tips for this section is to either stop gambling entirely or to realize what you're stopping point is when doing so. While I have gambled before (probably less than $100 in my whole life), I have never been one to enjoy it. But, I have seen people file bankruptcy after gambling too much, so the thought of losing money gambling is something that I've never wanted to personally experience. Gambling can be extremely risky, which most often makes it an unwise financial choice. However, if you choose to gamble, you should always know your stopping point, and you should be able to afford to lose the amount of money you are gambling with. Keep in mind that casinos exist for a reason – they are making money because people are losing money. An emergency fund is something I believe everyone should have, and this is one of the easy ways to save money as it can help you greatly in the future. However, according to a report by Bankrate, 26% of Americans have no emergency fund whatsoever. My husband and I have had roommates in the past, and while that’s not really as possible now that we live in an RV, I do recommend that anyone with an extra room in their house think about trying it out. While renting a room in your house will not make you rich, it may earn you a good amount of side income with little effort, and it is one money saving tip that I highly recommend! If you are interested in renting out a spare room on a short-term basis (such as for vacations), I highly recommend you check out Airbnb. I know people who are making thousands of dollars a month by renting out rooms on this website. Related blog post on this easy way to save money: A Complete Guide To Renting A Room For Extra Money. What other ways to save money and money saving tips are there? 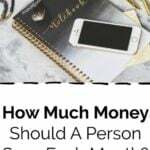 How much money do you save each month? I love the idea of buying a water filter to save money (and the environment!). I’ve bought a water bottle that has a water filter so that you can even filter your water on the go + away from your home. 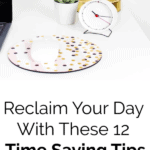 Wow these are a lot of great tips! I currently being lunch to work and cut my own hair. But I haven’t tried a lot of the tips above. Thanks for sharing! Yes to reading PF books, they are really helpful to be mindful on your finances. Everyone should read at least one PF book a year. And you can get it at the library. I try to buy everything while it’s on discount.. including your course 🙂 By the way, I’m loving your course! Thank you! Eating out is definitely started to get expensive for me. As homemade lunches are very time consuming, I prefer to eat out. I guess I have to start taking care of the small expenses to save overall! A lot of great ideas! You may actually save time with homemade lunches, though! When I worked in NY I had to limit lunches out to once or twice a month. I found myself staring at the vegetables at the salad bar, trying to figure out which ones were the lightest! The per pound cost for a little old salad was insane. I use an app for my grocery list. Not only does it make it easier when I’m shopping, but I can add items during the week when I realize I need them. The per pound cost for a salad is crazy! This is a really great list. I especially like drive a more affordable car and eat out less. I’ve always taken my lunches to work. Some may think you miss out on the social aspects of an office environment, but I don’t see that. The costs of eating out really add up! And I just wrote a blog post about keeping up with the Joneses (great minds think alike!). Yes, it adds up quickly! You are so right. I started to put all the money I would have paid for lunches into a jar, to save up for a holiday. It was shocking to see how quickly it adds up. One thing our family did was switched to another cable/internet company and dropped our landline. This alone saved us over $100/month. We are also cutting down eating out by at least 50%. That would mean more grocery shopping for a family of four and more cooking for chef Dad. No plan at buying another car this year at all. All our cars are over 10 years old but running really well. Thank you for this wonderful list. Bringing lunch to work is definitiely my favorite:) I have slowly converted my work colleagues to this instead of buying their $10 lunches from the food trucks outside. Those PB&J, Ham & Cheese sandwhiches may not taste as good as the food trucks, but you forget about it quickly when you see all the $$$ saved at the end of the month! We live in a very walkable city, with great public transport, so my husband and I sold both our cars once our son was old enough not to need the car for all his baby stuff – 13 years ago! We also grow some of own vegetables and fruit in our garden. We didn’t have to buy any jam / jelly at all, and had so much that we were basically giving them away to our friends and family, and froze the rest! I just listened to your podcast on The Side Hustle Show that aired November 16th, 2017. I am a new fan! You were very informational while keeping me engaged. Thanks for that! This is a very solid list. I do many of these on the list. I may look into getting a water filter because that seems like a good idea. Alot of these points resonated with me! Its important that women especially, learn to become financially independent as most of us will outlive our husbands. My husband died at a very young age so I have lived that reality. This is a great list – more like a roadmap. Wow this a great, actionable list! I also play the game “how long can I grow my hair before getting it cut” to reduce the costs of haircuts. Also play a similar game with dry cleaning lol. Very good…if young people could take these suggestions to heart…saving would be much easier for them..Heck, even older folks could heed your advice. .”Keeping up with the Joneses” can be very expensive…learned that tip long ago. All of your suggestions make the path to accumulating wealth so much easier..BUT I do gamble…however, I know my stopping point, when my purse is empty!! My husband started the head shaving about a year ago. His choice. I think I had made a comment about simply using coupons for haircuts or if he could at least tip the same every time… it was totally varied and I just wanted to know how much to budget for his haircuts. Then he started shaving his head. He looks like a convict and I’m not particularly a fan of it and he knows this. Sigh. Wow, nice list! The best tip what has worked for me, has been not only automate your savings but also automate your investing. Meaning, from every paycheck you will automatically transfer at least 7% to your broker account and invest this money to low cost assets, like index funds and ETF’s. Btw. you have a great site!